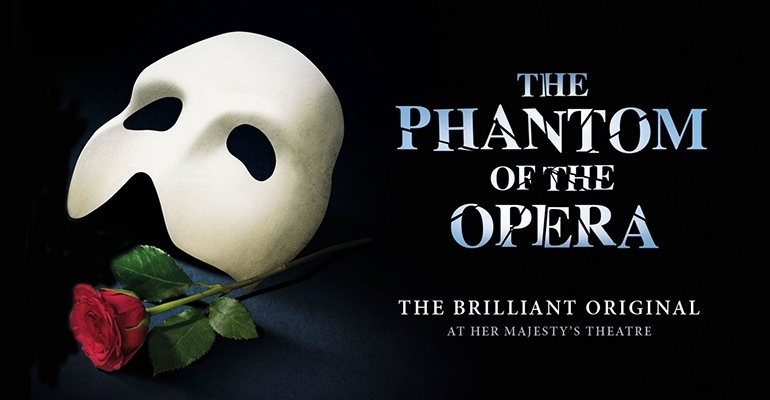 "the most successful entertainment event of all time"
Running at Her Majesty’s Theatre since 9 October 1986, The Phantom of the Opera is one of the most popular and beloved musicals in the world. Andrew Lloyd Webber’s smash hit has won both Tony and Olivier Awards, and broke Broadway’s record for longest running musical by thousands of performances. The modern classic is based on Gaston Leroux’s novel of the same name, where a disfigured musical genius lurks unseen in Paris’s opera house. He has taught orphaned soprano Christine to sing from a young age, but she and the rest of the company believes him to be a spirit. His unrequited love for her leads to tragedy, adventure and eventual remorse. Stunning design, technical effects and Lloyd Webber’s score have brought this unforgettable story to life each night, capturing the hearts and minds of West End audiences for decades. Recommended 10+. Under 4's will not be admitted into the theatre. I had the pleasure and delight of experiencing this clever, aesthetically and musically supreme assault on my senses. I left Her Majesties Theatre in 1996 a different person from the one that went in. 24 years later still hoping my husband may take me back. Show would have been fab but we could not stay till the end due to awful seats dont know how you except people to put up with such cramp conditions. We were not made awere of these conditions when purchaseing tickets. we would have not bought these tickets if we were pre-warned.When we asked the staff could we stand at the back and watch we were told we had to sit or leave. (very unhelpful) We had no option but to leave feeling very dissappointed. Brilliant I can't fault it, the singers were perfect I would thoroughly recommend it to every one,I had a brilliant time. The performance was wonderful. But the staff patrolled the auditorium the whole time to stop people taking photos. It was distracting and extremely irritating. Why don't you make an announcement before the performance begins and explain why you don't want people to take photos even when during the interval. It might also be a good idea to remind people not to talk or eat during the performance as some people seem to think they are at home in front of their own TVs. Enough grumbling; the performance was good. I have seen Phantom 5 times now, twice on Broadway and now three times in London. It was bitterly disappointing, not only because my centre stage view was blocked the entire time throughout the performance by the chap in front of me, but the woman who played Christine tonight (03.02.17) was terrible. She got it so wrong, she was aggressive, lacked any vulnerability and her voice was just awful - it made the entire performance almost unbearable. All in all, this is the weakest I have ever seen this show and I feel very let down! Fortunately my sister had never seen the stage show before and so felt it was ok, however, it was my treat to her and I wish it could have been as great as the four other times I have seen it. A very lacklustre performance by the cast. The Phantom of the Opera is my favourite musical of all time. It was our second time seeing the show today and just as memorable. The cast were all amazing and Ben Forster blew us all away with his amazing and deeply moving performance. I cannot wait to see it again!